Wharfedale started with great confidence and kicked off playing down the slope. The kick off was taken by Fylde but immediately turned over. 15 phases later Dale were awarded a penalty and they went for the corner. The penalty was for an “absolutely cynical” (quoting the ref) challenge by Fylde’s No6, Harlan Corrie, and he was shown the yellow card. A successful catch and drive was finished off by Dan Stockdale with Jack Blakeney-Edwards adding the conversion. Wharfedale carried on using the ball well and forcing Fylde to kick out of defence. The dominance ended when an off load was judged to be forward and Fylde had the put in at the first scrum. Fylde escaped punishment at the scrum when prop, Matthew Ashcroft, took a knee under pressure. Referee, Phil Davies, was on the wrong side and nothing came in from the touchline so the scrum was reset. Despite being driven back Fylde secured the reset and slowly made progress into Dale territory. A penalty was awarded for a high tackle and Gregory Smith took the three points. Small mistakes were beginning to creep in to Dale’s play. The home side lost a line-out on half way and this allowed Fylde to put together 14 phases of good controlled rugby before Henry Hadfield squeezed in at the right-hand corner for a try. Smith landed a superb touchline conversion to give Fylde the lead by 7 points to 13. It was Hadfield’s third attempt to beat the defence and this time he was given a little more time and space with a long pass from scrum half, Cameron Crompton. Dale kicked off and again soon forced a turnover and now pressed Fylde backwards. It still took a moment of magic to break down the Fylde defence. Oli Cicognini’s dance through and round tackles would have brought admiration on Strictly and he touched down under the posts. The Cico two-step took him past six Fylde players with hardly anybody able to grab hold of him. Blakeney-Edwards slotted the easiest of conversions to put Dale back into the lead at half time by one point. The closing minutes of the first half were played between the 22’s and the only moment of interest was the curious scrum penalty to Fylde. From a Wharfedale put in the visiting scrum reversed quicker then the British coxless 4 when winning gold in London. They also broke up. The result – a reset! The reset saw Dale again drive forward and Fylde disintegrate but…… a penalty to Fylde. Smith’s kick drifted wide and then he dropped Blakeney-Edward’s long 22 drop out to give Dale a scrum on Fylde’s 10 metre line. Dale could not capitalize and when Fylde got a chance, they kicked the ball dead for half time. Smith continued to have a poor afternoon when, after 12 minutes of the second period he missed an easy three points. 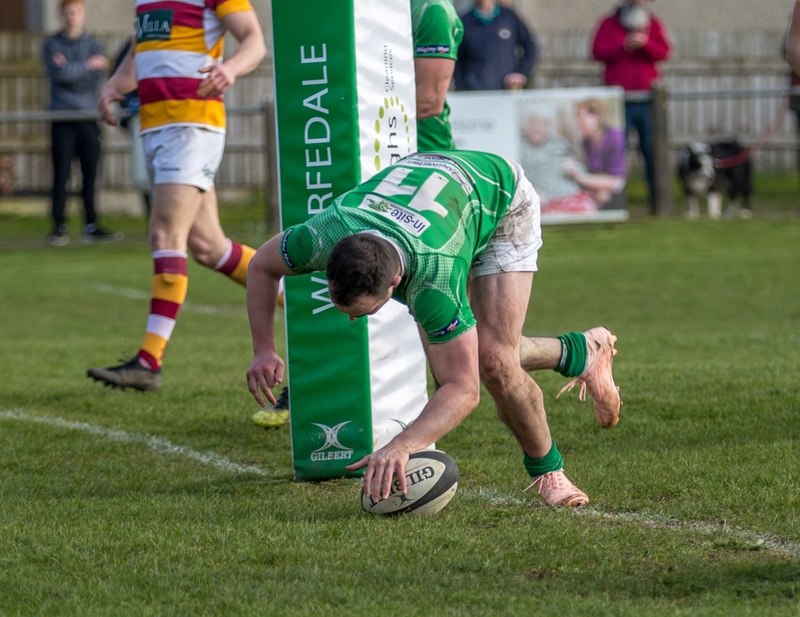 Wharfedale gained field position from the 22 drop out when Henry Hadfield allowed himself to be held up in the tackle and Dale had the put in at the scrum. Head Coach, Jon Feeley, commented after the game, “Fylde have some skilful players and we did really well to keep them to nil in the second half. We nullified their attacking potential and we controlled the pace of the game”. There was the odd feisty moment but those can stay on the pitch. I will remember the comment from Fylde’s replacement prop, Elliot Horner, who had come on after 30 minutes. He said “It was a tough battle. It was really enjoyable; that is what we play rugby for, win or lose”. Good to hear that sentiment still exists in the great game. Wharfedale: – Rian Hamilton, Ralph Wellock, Harry Bullough, Chris Walker, Oli Cicognini, Jack Blakeney-Edwards, Sam Gaudie, Toms Asejevs, Dan Stockdale, Reece Ward (Jack Hirst 56), George Hedgley (c), Ben Leacock, Matty Houghton (Elliot Stockton 41), James Tyson, Rob Baldwin. Replacements not used: – George Altham, Will Edwards, Tom Mann.